"Ethics of Ebola Research as Lived by West African Stakeholders"
Research conducted during the West Africa Ebola Virus Disease (EVD) epidemic (2014-16) occurred in a context of generalized fear and mistrust. The complexity of factors posing challenges to research in this context begs that in the aftermath of this public health emergency, lessons be learnt to inform future public health emergency research. This presentation presents an overview of the Wellcome-Trust funded “Perceptions and moral experiences of research conducted during the 2014-6 Ebola epidemic.” It takes as its point of departure the accounts of diverse research involved stakeholders from Guinea, Sierra Leone, and Liberia to shed light on the practical and ethical challenges of research during this public health emergency. 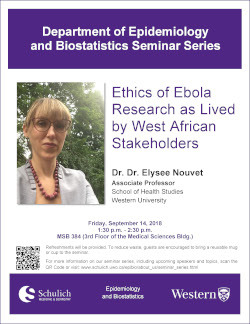 Dr. Elysée Nouvet (PhD) is a medical anthropologist, an assistant professor in the School of Health Studies at Western, and an assistant professor (part-time) in the Department of Health Methodologies, Evidence and Impact at McMaster University. She has led or co-led studies in Canada, Nicaragua, Nepal, and several sub-Saharan African countries. Her work focuses on lived and moral experiences of global health research and care programs, as well as on advancing understanding of how cultural values, histories, and relations can shape perceptions and normative responses to pain and suffering in specific contexts. Light refreshment will be provided. To reduce waste, guests are encouraged to bring a reusable mug or cup to the seminar. All are welcome.